Well connected, varied accommodation choices and in one of our favourite European cities: there’s plenty in this cluster of boutique apartments to love. Add to that the bright and cosy home-from-home interiors and you’ve got a pad in Spain’s capital that you’ll never want to leave. 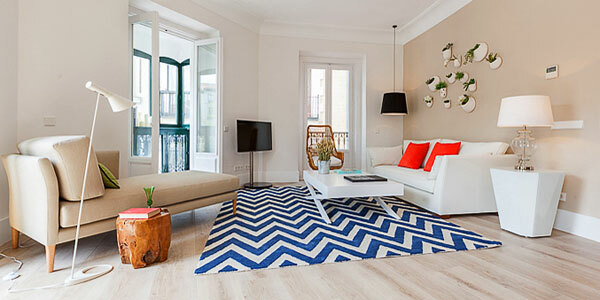 Though they’re new on i-escape, these apartments (ranging from 1 to 2 bedrooms apiece) have quickly established themselves as the perfect Madrid base, particularly for families or couples looking to experience the lively and bustling side of Madrid without losing the home comforts. 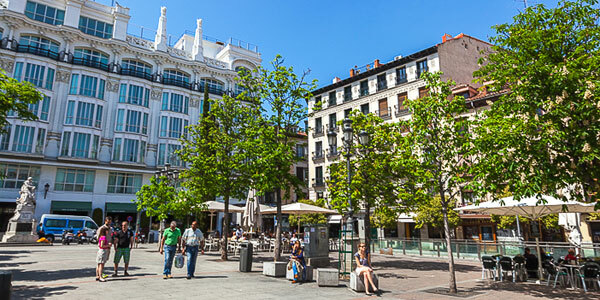 They’re an ideal retreat, whether you’re looking to soak up some culture, sample some Spanish gastronomic delights, or do nothing more strenuous than sipping sherry by the Plaza. 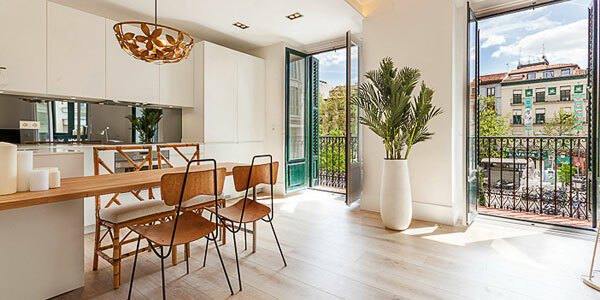 Rooms: The sleek and contemporary apartments range from 1-bedroom boltholes with double bedrooms and spacious living areas (dotted around the city centre) to the airy 2-bedroom apartments located near Plaza Santa Ana and the iconic Gran Vía. 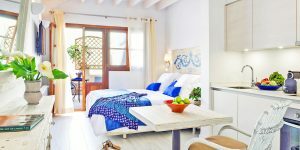 We stayed in Santa Ana II which, with its bright rooms, colourful art and sleek bathrooms, is typical of these carefully designed and well equipped urban getaways. Next door is the appropriately named Santa Ana I which benefits from French-window views over the square – ripe for people-watching in the warm air of the evening, when the city reawakens. With comfy sofas, flatscreen TVs and DVD players, the apartments are also well equipped for the occasional bout of downtime. 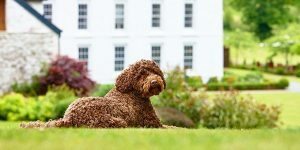 If you’re travelling en famille, we’d suggest Valverde I which is the quietest of the 2-bedroom apartments; it has a second bedroom with twin beds and access to a separate shower room. 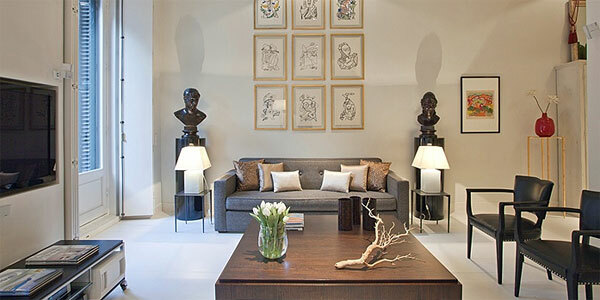 There’s even a piano and sculptural chandelier in the spacious – and super-stylish – living area. For a more romantic retreat, we liked the look of 1-bedroom Lagasca X (in sophisticated Salamanca) and Calle Mayor II (in super-central Los Asturias), both of which mix contemporary furniture with splashes of petrol blue and moody red. Food: Each apartment is well stocked with all the appliances and utensils you could need, including a dishwasher and microwave (more than many other city rentals we’ve come across). You’ll be welcomed with a selection of basics like milk, coffee and bottled water. For the rest, you’re never far from a convenience store or supermarket and, if you don’t feel like whipping something up yourself, visiting chefs can be arranged. Should you decide to head out, you’ll find yourself spoilt for choice – whichever district you’re in. Plaza Santa Ana is packed with choices, including Cinco Jotas (good Spanish fare) and Cervecería Alemana (a favourite haunt of Hemingway). You can also head around the corner to 100 Montaditos on Calle Príncipe (lots of choice and great for kids) or take a short walk to one of our favourite tapas bars, Lamiak at 10 De La Rosa. Top Tip: Madrileños are obsessed with rooftop bars. Our favourite has to be the terrace at El Círculo de Bellas Artes, a cultural centre located on Calle de Alcalá. It has panoramic views of Madrid, and on a clear day you can see all the way to the mountains beyond. For more offbeat tips and alternative things to do, take a look at our recent Madrid blog.